I'm great auntie to a passel of little boys belonging to various nieces and nephews. There are seven in all. I love each of them, but one in particular tugs at my heart strings -- a middle child like me. His Dutch name sounds like Out -- at least that's the way it often sounds when his mother says it. One day Out came to visit with his mother and baby brother. The circular layout of our home is perfect for running, it turns out, and by lunchtime, Out's whirling socks had given our floors a high polish. I was glad when it was time for him to sit at the table to eat. While Out listlessly toyed with his food, I began returning freshly washed knives to their magnetic holder on the wall. I'd raise one up, and when it got close enough, the knife would snap onto the holder. SNAP went the first knife. Leaping from his chair to my side faster than you could say "Don't jostle me when I'm handling knives," he began peppering me with questions about just how that knife holder worked. Could he try it? "Umm, no. Maybe in 10 or 15 years." His eyes remained glued to the knife holder. This seemed like a good time to go downstairs to the family room, where some art projects were set up. Although the art stuff was a bit dull, the hand cords of my Nordic Track Classic Ski Machine were not. Seems they're good to dangle from. After a few minutes of dangling, while his mother was occupied with changing baby brother, heading for the stairs, Out declared, "I'll be right back.". After a brief exchange of raised eyebrows with his mother, I followed. In the kitchen, I found Out staring up at the knife holder. Appeased with nothing less than a full description of how it worked, Out learned that metal things such as knives stick to the holder because it's a magnet. Out began muttering to himself. "What are you thinking about, Out?" I asked. This might be important information. "My trucks!" he said. "My red truck is metal. My green truck is metal. My orange car is metal. They'd stick to the mang-ga-net!" "Why yes!" I agreed, relieved that the subject had turned from knives to trucks. "Metal cars and trucks would stick to the knife holder, if they're made of the right kind of metal." His curiosity finally satisfied, Out allow me to coax him away from the kitchen and back down to the family room. Later that afternoon while Out was on his way home with intact fingers and eyeballs, I sat down at the computer and ordered a magnetic knife holder for him. It would be shipped directly to his home, so I emailed his parents to let them know, adding that they might want to mount it on Out's wall to hold some of his trucks and cars. It's a very fortunate thing that Out's parents have a sense of humor, for when the knife holder arrived, Out opened the package, and -- to his vast and astonished delight -- it contained not only a magnetic knife holder, but real knife as well! And that's how I became one of Out's very, very favorite great aunties. 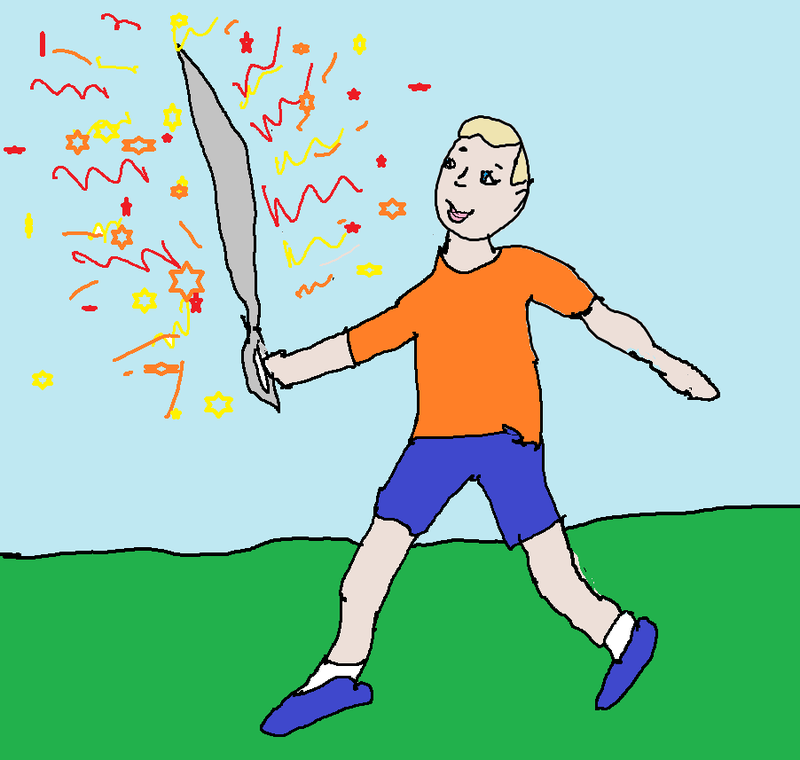 Out's passion for sharp metal objects, which I had unwittingly loosed, led his parents to give him an impressively large plastic sword. It flashes and makes a lot of noise to compensate for the fact that it doesn't cut things. I feel a teensy bit guilty about this. Postscript: Since this story was written, two great-nephews and two great nieces have been added to our crowd. AND a girl grandbaby. Now that she's two, she displays a similar attraction to sharp metal objects--in her case cooking knives like her mum uses. Glad I didn't start this one! Biker Bob Goes for a Walk - Taking a simple walk isn't all that easy. Yah, maybe some day I'll teach him about something a bit less dangerous. Thanks for dropping by, Bad!